Organic Link complete care for plants, lawns, palms, vegetables, natives, shrubs & soil with added zeolite for natural water retention. Now with Microbes. Will boost plant health, quality & production, while increasing soil fertility. 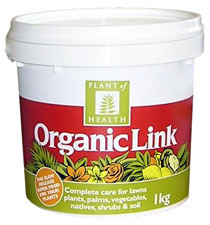 Organic Link 1kg $14.50 Special price: $0.00. Not online sale. Organic Link 4kg $33.50 Special price: $0.00. Not online sale. Organic Link 25kg $89.00 Special price: $0.00. Not online sale.